I’ve been to 4 anime conventions, and my fifth one is coming up fast. I’ve cosplayed every time and it’s always a blast. However, a lot of my cosplays have been uncomfortable, making the convention less enjoyable. There are many things that I would do differently to make my next convention a better experience, which i’ll share. All of the events are great, but uncomfortable cosplays and poor planning can ruin the experience. 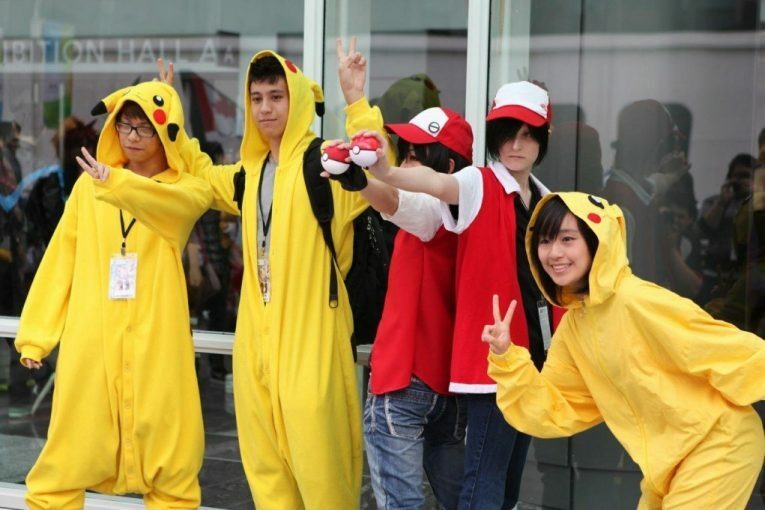 So here are 4 things you should definitely think about when planning your next anime con. I cosplayed as Kiki from Kiki’s Delivery Service when I went to my second anime convention. The cosplay was comfortable, as well as simple, but the shoes were a nightmare. I wore brown flats and they gave my feet so many blisters. Since anime con is three days, you’re obviously going to do a lot of walking. I didn’t even make it to day 2 with the flats I was wearing. In fact, they hurt my feet so badly that I changed my whole cosplay. So, whatever you cosplay as, never wear flats. Ever. For my fourth anime convention, I cosplayed as Gerard Way from My Chemical Romance. and I used my red eye-shadow. It seems so simple that nothing could go wrong, right? I forgot to wear an undershirt with my cosplay, and it was so uncomfortable. The shirt was itchy, which was super distracting, especially when I was trying to listen to the voice actors during their panels. This made me change my whole cosplay for the last day of the convention. When you’re budgeting your money and you’re setting some aside for anime con, don’t forget to make sure you save some money for food. You might think that you’ll be so busy going to panels and buying merchandise that you won’t even think about food, but you will get hungry. On the 1st day of my 3rd anime convention, I didn’t eat lunch and I was DYING by the end of the day. I was starving and felt miserable. The convention was still fun, but it was so unpleasant being hungry for most of the day. The 2nd day I ate lunch, but I was still hungry throughout the day. So, in addition to money for meals, it would be smart if you also set aside some money for snacks as well. There are so many things going on at anime conventions, such as panels, meet and greets, costume meet ups, j pop battles, and many more events. There’s so much stuff going on that itt’s easy to get lost in it all, so it’s smart to go with a schedule. I didn’t have a schedule for my first 2 anime conventions, so I missed a lot of things that would have been fun. For my 3rd and 4th visits, I had a planned out schedule and ended up being able to see a lot of fun things at the convention, like several panels and meet-and-greets. At the Sacramento anime convention, they give you a program that shows a map of the convention center, which is helpful. The program also includes a schedule of the events, but it’s better to look through it the day before and make a schedule of the events you most want to attend. Every anime fan should go to an anime convention at some point in their life. It’s an amazing experience and it’s something you shouldn’t miss! Follow Masaomi Soma on Instagram. I am extremely passionate about anime and I am so happy to have a way to share my passion with the world! My favorite anime’s are Erased, Blue Exorcist, Sword Art Online, Food Wars, and many more! There’s just too many good anime’s out there. I hope you find my blogs both interesting and inspiring! Did You Know About These Top 10 Anime Companies In Europe?